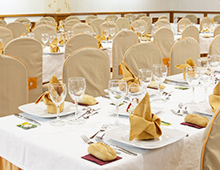 Our family hotel, has been giving service to its clients over 26 years. Our experience makes any stay perfect, of both long and short duration. Located in the heart of the Manchuela, County located northeast of the province of Albacete, bordering the provinces of Valencia and Cuenca. The Manchuela has a clearly different aspect from the Llanos region of La Mancha and is greatly influenced by the Júcar River, which crosses from east to west, creating landscapes of contrasts between the valley and plain, always surprising for the traveler. So we are at your disposal, and if you are a fan of adrenaline, sport and nature do not worry that we will provide you with good food and rest to make the most of your adventure and your stay. In our restaurant we have daily menus, a typical Manchego and Mediterranean menu and an extensive assortment of appetizers and desserts. 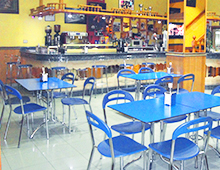 Seating for weddings, communions, baptisms, birthdays or any meetings or private parties. Estimates without obligation, sure we will adjust to your needs. In our cafe we serve breakfast, lunch and tapas throughout the day. Typical Manchuela dishes that will delight all our customers. 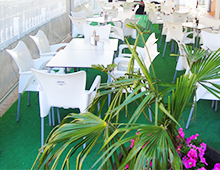 In the summer months we have a semi-covered terrace so you can enjoy our meals outdoors (terrace open from May to October). We also have a bouncy castle for the kids to play. Being located in our side yard there is no danger to them. 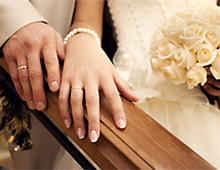 Weddings, communions, baptisms, birthdays or any meetings or private parties. Estimates without obligation, sure we will adjust to your needs.